Unless you've been living under a rock, it's hard to ignore the expanding force of craft beer snobs taking over the world of artisanal drinks. With craft brewers constantly creating new, exciting flavour profiles, beer is more interesting and versatile than ever. Dining outside of the pizza and bar snacks realm has always called for a match with our good friend, vino. We know an epic food-beverage pairing takes a meal to the next level, and now, we have a whole new world of drinks to match with food! Crafty, complex profiles make these beers just as worthy of a flash food pairing as wine. Lager is probably the easiest beer to drink. Its malty, light-bodied taste can be subtly spicy/floral/bitter/sweet, but always crisp and clean. Guzzle it down with cheesy foods, smokey BBQ or pork. Pale Ale is medium-bodied, usually with a citrusy hop character and a refreshing dry finish. This beer wows with roasted dishes, grains like quinoa and farro, popcorn and Brie. IPA (India Pale Ale) has higher alcohol content (yassss) has strong fruity or aromatic flavours and a lingering bitterness. It's an absolute winner with curry and other spicy foods, as well as high fat meats and Kiwi classic fish and chips. Pilsner has medium hoppiness/maltiness. Pair with pizza, salads, salsa, chicken or creamy pasta. Red Ales have tasty toasty malt and caramel flavours. They go well with seafood, chicken and tofu. Darker beers more your thing? Porters have roasted malt and often chocolate flavours, and are great with all smoked foods. Dessert? You can't go past a dark, thick Stout! These malty beers are often infused with chocolate, vanilla, coffee or toffee - yummm! They also go well with grilled foods and hummus. These guidelines are not gospel, however! If you want to think, and drink, outside the box, there are a few other ways brewers suggest to go about creating your own tasty pairing. 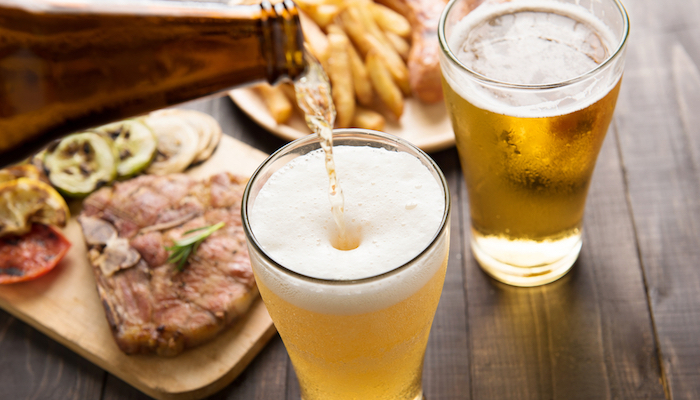 One is to match strength with strength - the more delicate, lighter beers on the list above with delicate foods and stronger, more intense beers with rich or spicy foods. Or, you can try to match the flavour profiles - smoother, maltier beers with sweet food, hoppier beers with savoury food. Or balance the flavours out - sweeter, subtler foods with more intense, palate-grabbing beers and vice-versa. Eat, drink, and repeat, team!